32" x 48" rectangular acrylic backboard. Includes border and target. 4" x 5" goal mounting pattern. 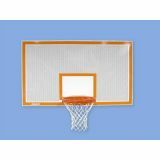 Basketball Perforated Steel Backboard, 42" x 72"
Rugged 42" x 72" 11 gauge steel face has 1/4" diameter perforations to provide an open area to minimize wind resistance. Rear support frame allows for multiple mounting conversions. Durable white powder coated finish with a silk-screened orange target and border. 5" x 5" goal mounting pattern. Rugged 42" x 72" 12 gauge steel. Rear welded 20" x 35" mounting pattern. Durable white powder coated finish. 5" x 5" goal mounting pattern. 36" x 54" cast aluminum with 1-1/2" flange. Painted white with orange target and border markings. 5" x 5" goal mounting pattern. Lifetime Guarantee! Official size 39'' x 54" x 1" thick HD polyethylene. 5" x 5" goal mount pattern. 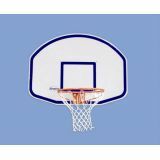 Graphite Replacement Basketball Backboard for Little Champ, 35" x 48"
35" x 48" Graphite board. 2-3/4" x 3-1/2" hole pattern. Use with G-35 goal. Rear mounting pattern 17 1/2" x 15 1/2". Converts existing backboard to youth regulation height of 8' 6". 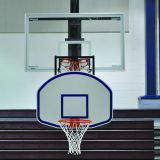 Designed to fit on any style rim and rectangular backboard, with or without edge padding. Frame features adjustment hinge to ensure the board is always plumb. Our exclusive hinged rim folds up and the rear frame folds down for storage. 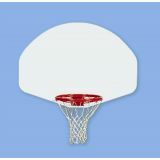 Includes fan shaped backboard, attachment frame and official size goal with nylon net. 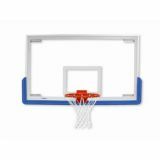 Quickly converts regulation height courts to accommodate youth league requirements. 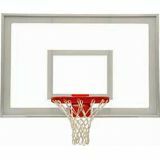 Backboard and frame provide an official youth goal height of 8'6" and brings the goal 2' closer to the foul line. Unique two-piece frame is designed specifically to improve the ease of set-up with no modification to the existing goal structure necessary. 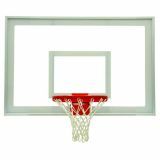 Includes full-sized (35" x 48") graphite backboard with aluminum backframe and official size 5/8" goal with nylon net. New Generation Little Champ - The BEST, now even BETTER! 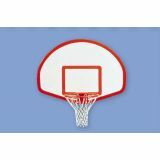 Great for youth leagues and developing elementary shooting skills. Safely attaches to ANY goal and backboard and CANNOT be dislodged during play. Installs in seconds by one person from the floor with its lightweight aluminum construction. Quick and easy height adjustable from the floor - 6-1/2' to 8-1/2' - no need to disassemble. 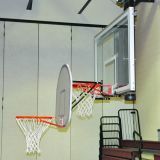 For safety, no part of the structure ever extends below the backboard. The ultimate in compact storage with hinging rim and folding aluminum frame. Dual wheels for easy transport. Adjustable frame overcomes sagging rims. Moves goal 2' closer to the foul line. 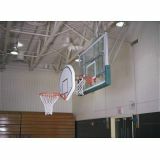 Comes complete with fan shaped backboard, attachment frame and official size goal with nylon net. Comes fully assembled. Unique design allows the impact load on goal to be transferred directly to an engineered lower reinforced steel frame member, without putting any stress on the glass. High strength, clear anodized aluminum channel outer frame, which is lightweight and attractive. 42" x 72" by 1/2" thick rectangular tempered glass. 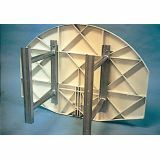 Direct mount or four corner mounting applications: 4" x 5" hole pattern, or 35-1/2" x 62/66" mounting dimensions. Pre-drilled for “Safe-Pro" bolt on edge padding. Meets all NCAA and high school specifications. 36" x 48"rectangular acrylic backboard. Includes border and target. 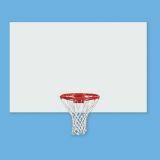 4" x 5" goal mounting pattern.